The cabinet’s nod to the defence ministry’s strategic partner (SP) policy sets the stage for selecting six Indian firms to partner foreign original equipment manufacturers (OEMs) in building single-engine aircraft, helicopters, submarines and armoured vehicles in India. While the details of the SP policy are still to be made public and incorporated into the Defence Procurement Policy of 2016, the defence ministry had indicated its contours to private industry executives earlier this month. Broadly, the ministry intends to follow most of the recommendations of the Dhirendra Singh Committee (2015) and the VK Aatre Task Force (2016) in choosing Indian SPs. These will form joint ventures (JVs) with selected global OEMs and respond to defence ministry tenders for building defence equipment in the four chosen categories. 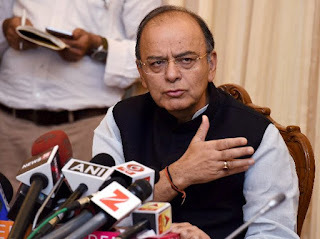 With Manohar Parrikar having done the spadework, an optimistic Defence Minister Arun Jaitley has declared his intention to implement the SP policy at the earliest. This will please the air force, which has already approached global OEMs for building single-engine fighters in India; the navy, whose building of six conventional submarines can now proceed; and the army, which is in dire need of armoured vehicles and helicopters. Yet, there is uncertainty whether the policy, pushed through hurriedly by Mr Jaitley, will indeed transfer defence manufacture to India. A key problem for Indian SPs, as well as for overseas OEMs, is the 49 per cent foreign direct investment (FDI) cap imposed on the JVs that must manufacture defence kit in India. The OEMs complain the cap leaves them with insufficient control over the technology they provide to the JV. This would lead to the manufacture of relatively low-tech equipment in India, with OEMs preferring to supply the high-technology components, sub-systems and systems from abroad. The Indian SPs are aggrieved for a different reason: they complain their minimum stake of 51 per cent leaves them with all the risk even though their foreign OEM partners hold all the big cards --- the technology knowhow. There are also worries that the new SP policy is too narrowly focused. Its aim cannot be just to create “systems integrators” that assemble foreign-built sub-systems and systems into a military platform in India. 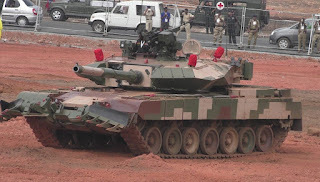 Rather, the policy must ensure India develops the entire eco-system for manufacturing the defence platforms in question, including Tier-1, Tier-2 and Tier-3 suppliers, the component and materials manufacturers – not to forget the capability to subsequently maintain, repair, overhaul and upgrade the platform through its service life. The SP policy, as communicated to industry so far, does not cater for this. Nor does it acknowledge the complex manufacturing chains of global OEMs, which involve multiple tiers of independent vendors that feed into a complex weapons platform. Many Indian defence firm executives believe there is a strong case for giving the lead to the OEM, rather than the Indian SP, along with a majority stake and the responsibility to negotiate with its sub-vendors to ensure a specified percentage of manufacture is transferred to India. The ministry can ensure strategic control over the JV, even one where the foreign partner has a majority stake, by mandating that it be located on Indian soil, have only Indian employees and be run by Indian executives. The SP policy must be in touch with the realities of the global defence industry. President Xi Jinping was a satisfied leader last weekend as he beamed at officials from over 70 countries, including 28 heads of state, gathered in Beijing for the coming-out party of his signature project – formerly called One Belt, One Road; and now dubbed the Belt and Road Initiative (BRI). “In the autumn of 2013, respectively in Kazakhstan and Indonesia, I proposed the building of the Silk Road Economic Belt and the 21st Century Maritime Silk Road, which I call the Belt and Road Initiative… Four years on, over 100 countries and international organizations have supported and got involved in this initiative. Important resolutions passed by the UN General Assembly and Security Council contain reference to it. Thanks to our efforts, the vision of the Belt and Road Initiative is becoming a reality and bearing rich fruit”, declared the Chinese strongman. The belt in this awkward label is the “Silk Road Economic Belt” – a network of road, rail and telecommunication links and energy pipelines that are planned to seamlessly connect China, through Central Asia, with Europe. It also includes the China-Pakistan Economic Corridor (CPEC), running from China’s north-western Xinjiang province to Pakistan’s Gwadar port, on the Arabian Sea. 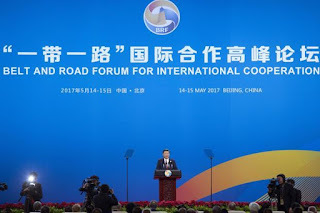 Meanwhile, the road, in “Belt and Road”, refers to a sea route connecting southern China with east Africa and the Mediterranean Sea. That is why it was a Great Power moment for China last weekend as friends, allies and even adversaries like the United States, Japan, South Korea and Vietnam sent senior representatives to Beijing. India boycotted the forum to protest China’s routing of the CPEC, without adequate consultation with India, through Gilgit-Baltistan, in Jammu & Kashmir (J&K), which India claims, but Pakistan occupies. “We are of [the] firm belief that connectivity initiatives must be based on universally recognized international norms, good governance, rule of law, openness, transparency and equality… Connectivity projects must be pursued in a manner that respects sovereignty and territorial integrity”, said India’s ministry of external affairs in an official statement on Saturday. China describes Belt and Road Initiative as a “win-win” economic strategy that will galvanize global trade, just like the series of Silk Roads that made China an economic powerhouse until the industrial revolution, backed by western naval power, muscled China and India out of their pre-eminence in global trade. According to Xi, trade between China and OBOR countries has exceeded $3 trillion over the period 2014-16. Chinese companies have established 56 economic cooperation zones in more than 20 countries, creating 180,000 jobs and over a billion dollars in tax revenues. Chinese investment in those countries has surpassed $50 billion, and will be scaled up sharply as projects are implemented. The CPEC alone will require an estimated $56 billion of investment. To do so, Chinese companies are working on railway lines that connect Jakarta-Bandung, China-Laos, Addis Ababa-Djibouti and Hungary-Serbia railway. China has upgraded Piraeus port in Greece and Gwadar in Pakistan. Beijing rarely mentions that the network of roads and railway lines that undergird BRI generate badly needed work for Chinese infrastructure building companies that have built the new China, but are now running out of work projects in their home country. Chinese banks will provide loans to countries to pay for this infrastructure building, but those loans would require servicing and repayment, potentially creating the debt trap that India has warned about. Beijing allays these fears, pointing out that enhanced trade flows would provide the income needed to service the loans, while also creating employment for millions along the trade highways. Yet, this is not what transpired in Sri Lanka, where the Hambantota infrastructure development project generated far less income than had been anticipated, while piling up crushing debt for Colombo. Currently, the Sri Lankan government is dealing with the political fallout of restructuring unmanageable debt into equity holding for Chinese firms, which locals object to as a violation of sovereignty. However, countries like the Central Asian Republics that are already benefiting from Chinese-built infrastructure, including roads, railway lines and power generation, strongly back the Belt and Road Initiative. With little domestic industry to protect, they welcome cheap Chinese manufactured goods, and are happily providing new homes for Chinese steel and cement factories that Beijing is shifting out of the saturated Chinese market. Meanwhile, vast tracts of empty Central Asia steppe has been leased to Chinese farming companies, which supply agricultural produce back to farmland-stressed China and, after adding value in Chinese agri-business factories, re-exporting it to the countries where it was grown. Besides providing China with employment, income and markets, this additionally provides Beijing with geopolitical clout. With a bumbling President Donald Trump looking to Make America Great Again by withdrawing from a leadership role in China’s vicinity, Beijing has a god-sent opportunity to posture as a responsible leader and driver of global trade for the benefit of all. So Beijing also paints the Belt and Road Initiative as a boost to regional development strategies like Russia’s Eurasian Economic Union, the Master Plan on ASEAN connectivity, Turkey’s Middle Corridor initiative, China-Mongolia-Russia Economic Corridor, the New Eurasian Continental Bridge and others. Interestingly, there are more critics inside India of New Delhi’s scorning of the BRI than there are abroad. Mani Shankar Aiyar, in a scathing op-ed for NDTV, suggested that India was isolated since 29 heads of state/government and 130 national delegations attended the Forum in Beijing. These included all India’s neighbours, except for Bhutan. Even Washington sent a Trump “top aide”. The reality, of course, is that sending a delegate to Beijing does not necessarily mean support to BRI. Washington certainly does not support it; nor does the Group of Seven, of which only Italy fielded a head of government. Many countries in China’s geographical vicinity sent delegates despite serious concerns about what Belt and Road might mean for them. They attended, nevertheless, so as not to attract the Dragon’s ire. In the circumstances, India’s very public boycott could be interpreted as an unusual display of spine. By going along with the crowd, India has seriously damaged its own interests in the past. After the People’s Liberation Army invaded Tibet in October 1950, India’s reluctance to criticise China in the United Nations led to practically the entire international community following suit, thus permitting Beijing to annex Tibet – for which we paid the price in 1962 and continue to do so today. 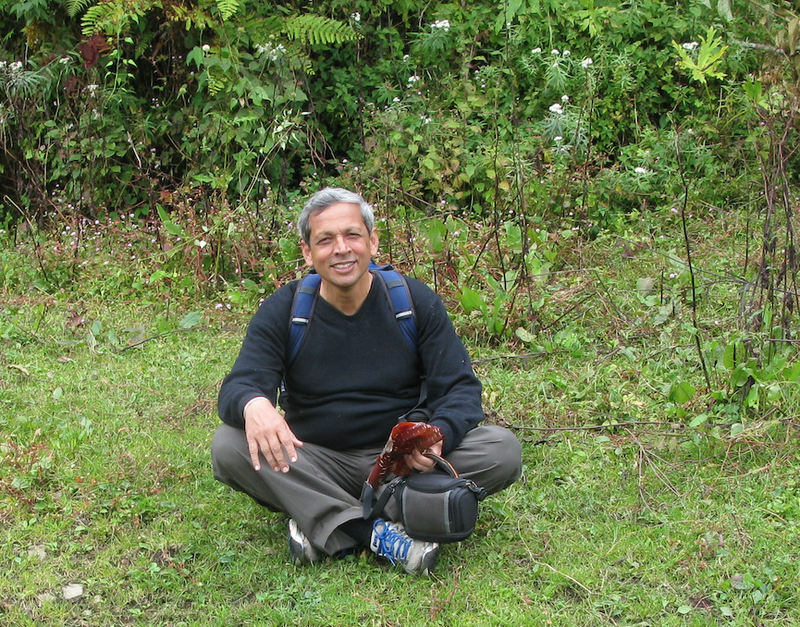 Prem Shankar Jha argues that India is unjustified in citing sovereignty violation by routing the CPEC through Gilgit-Baltistan, since China and Pakistan had been using the Karakoram Highway, which has the same alignment, since the 1960s, a period in which India-China trade increased twenty-fold. Others have argued that India should support the CPEC as it could itself benefit from branch corridors to India. That argument overlooks the fact that far greater benefits and trade volumes could flow between China and India through direct corridors – such as a China-Nepal-India corridor linking Lhasa with Kolkata, via Kathmandu; another one linking them via Sikkim; and a third via Lohit and Guwahati. It is political differences, especially China’s hardening stance on the border dispute and its insistence that India cede Tawang to China, that stands in the way of India’s support to corridors with China. None of these arguments recognise that India’s hard stance against the CPEC also stems from New Delhi’s anger at China making common cause with Pakistan in blocking India’s membership of the Nuclear Suppliers Group and the blocking in the UN of Jaish-e-Mohammed chief Azhar Masood’s designation as a terrorist entity. Current Sino-India dynamics are also shaped by China’s overblown reaction to the Dalai Lama’s visit to Tawang (accompanied by a Union minister), and his reception by President Pranab Mukherjee in the presidential palace in New Delhi. Given the fraught nature of the overall relationship India could hardly be expected to ignore Beijing’s blithe disregard for India’s sovereignty concerns. Make in India: Will strategic partners spur defence manufacturing? 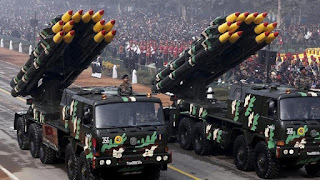 On Monday, a meeting of the defence ministry’s top procurement body, the Defence Acquisition Council (DAC) failed to clear a new policy for nominating private defence companies as “strategic partners” (SP) for building major weapons platforms for the military. This is expected to come up before the DAC again, with some changes, later this week. The contours of the new policy had been spelt out on Thursday to chief executive officers (CEOs) of private defence firms, who were briefed by the ministry. Under the new policy, six Indian private firms that met stipulated financial and technical criteria would be selected as SPs --- described as “‘system of systems integrators’ that would set up a widespread industrial eco-system encompassing development partners, specialised vendors and suppliers, especially those from the MSME (micro, small and medium enterprises) sector”. Chosen SPs would be expected to establish production joint ventures (JVs) with global original equipment manufacturers (OEMs), shortlisted by the ministry. After competitive bidding, one JV would be chosen for each of four categories – single engine fighters, helicopters, submarines and armoured vehicles. Former defence minister, Manohar Parrikar, had repeatedly promised an SP policy, but missed numerous deadlines over the last two years as various stakeholders – ministry bureaucrats, public sector defence companies and different segments of the private sector – failed to find meeting ground. The policy was to form part of the Defence Procurement Procedure of 2016, but that was eventually issued last June without the chapter on SP policy. Meanwhile badly needed acquisitions, such as single-engine fighter aircraft for the air force and submarines with air-independent propulsion for the navy, languish without an SP Policy to select the Indian vendors that would build these platforms locally. Why private sector “strategic partners”? The National Democratic Alliance government has always regarded defence production as a key vehicle for job creation. In 2014, the Bharatiya Janata Party’s election manifesto promised that India would “harness its skilled human resources and technical talent to emerge as a global platform for defence hardware manufacture and software production”. Private sector partnership was to be the key in achieving this goal. Yet, for the next two years, the government took only baby steps towards this end. It eased defence licensing, allowing private firms to manufacture more products without licenses. The cap on foreign direct investment (FDI) in defence was eased from 26 to 49 per cent. Taxes and duties were rationalised and private manufacturers protected against foreign exchange rate variation. Even so, private industry has waited impatiently for a Big Bang manufacturing reform that would bring it on par with the privileged defence public sector undertakings (DPSUs) and ordnance factories (OFs). That is why many welcome the SP policy, conceived in 2015 by the Dhirendra Singh Committee. In 2016, a follow-up task force led by former Defence R&D Organisation (DRDO) Chief VK Aatre recommended the financial and technical benchmarks that Indian firms must meet to be nominated as SPs in ten different technology realms. It was envisaged that one SP each would build aircraft, helicopters, aero engines, guns, submarines, warships and armoured vehicles; while two SPs each would manufacture metallic material and alloys; non-metallic materials; and ammunition, including smart munitions. The SP policy being finally issued envisages just four technology realms. The idea of empowering select private companies goes back to 2005, when the Vijay Kelkar Committee conceptualised the “Make” procedure. 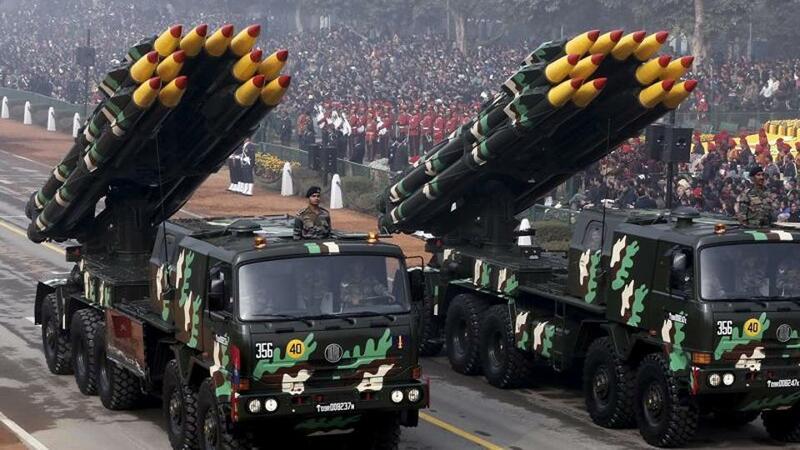 This envisaged Indian private and public firms designing and developing complex weaponry, with the defence ministry reimbursing 80 per cent of the cost and assuring manufacturing orders for products that met the military’s requirements. The “Make” procedure went well beyond mere licensed manufacture and aimed at creating design capability and system integration skills in India. To implement the “Make” procedure, the ministry’s Probir Sengupta Committee identified twelve companies, designated “Raksha Udyog Ratnas” (RuRs, or “defence industry jewels”). Like SPs, these RuRs were selected based on strict financial and technical criteria that favoured larger companies. However, trade unions of DPSUs and OFs pressed then defence minister, AK Antony, to scuttle the concept, fearing that RuRs would put them out of business. Smaller defence companies also objected, worrying that RuRs would corner the market, leaving little for smaller companies. Although the RuR concept never took off, the “Make” procedure remains a category in the Defence Procurement Procedure (DPP). Two “Make” category acquisitions are currently under way --- the Tactical Communications System, and the Battlefield Management System, with a third being evaluated to build a Future Infantry Combat Vehicle. The “Make” category accords major responsibility to the defence ministry, which would have to create a methodology for assessing cost-plus pricing, since it must accurately assess and reimburse design cost claims of vendors. Another alternative for the private sector is the “Buy & Make (India)” category of procurement, which was promulgated in DPP-2011. This requires Indian vendors to partner foreign OEMs of their choice in bidding to build proven military platforms, which meet defence ministry specifications. This model has yielded at least two procurements already --- Tata Advanced Systems Ltd is manufacturing naval combat management systems in partnership with Danish company, Terma; while Tata Power (Strategic Engineering Division) is building anti-diver sonar in partnership with Israeli firm, DSIT. Private company CEOs say the new policy has met its objective of insulating ministry decision-makers from future allegations of wrongdoing by introducing competitive bidding for winning contracts. Instead of choosing one/two SPs for each segment, as proposed by the Aatre Task Force, the ministry will choose six SPs to compete in multiple segments. When one SP wins a contract, it would be eliminated from further tendering, since the SP policy restricts each company to a single segment. This would scuttle an OEM’s bid the moment its SP partner is selected in another segment. For example, if Lockheed Martin partners L&T to build single-engine fighters, their JV would stand nullified if L&T won a tender to build armoured vehicles. Private firm executives also complain the government is taking on too much, by nominating the SPs as well as the foreign OEMs. Given there would be just one-to-three OEMs and an equivalent number of SPs in the fray, the latter complain they would have little negotiating leverage. This lack of negotiating leverage would play out in other ways too. An Indian CEO cites the 49 per cent FDI cap on OEMs to argue that the Indian vendors would carry 51 per cent of the risk, while the OEMs – who would supply most of the technology – would control 85 per cent of the cost. Since the OEM would extract his technology cost through a transfer pricing mechanism, the SP would be left with little financial benefit, but a majority share of the risk. “In a ‘Buy & Make (Indian)’ category acquisition, the Indian partner decides the foreign partner, and effectively negotiates the price. In the SP policy, the Indian partner is reduced to being the assembly house of a foreign OEM”, says an Indian defence CEO. Furthermore, few Indian defence companies have the technological savvy to negotiate on comparable terms with high-tech OEMs. This is especially true of new entrants like Reliance Anil Dhirubhai Ambani Group and Adani Group, which have so far demonstrated no defence technology capability. Given that, selecting these firms as SPs would be fraught with risk for decision-makers, given their perceived proximity to the ruling party. Indian companies like L&T and Tata Power (SED), who have developed genuine technological capability in defence, worry that foreign OEMs would prefer Indian SPs with lesser technological capability, upon whom the foreign partner could impose terms. Without the capability to demand a greater share of manufacture; or to absorb technology to capture the maintenance, repair, spares, overhaul and upgrade market, a weak SP would allow the OEM to defeat every aim of indigenisation. Additionally, there are apprehensions even within the ministry that companies without strong defence technology capabilities might prefer to leverage their SP status into lucrative land grants, defence technology enclaves, low-cost bank loans and initial public offerings, rather than risk foraying into defence manufacture. Nor does the SP policy provide for penalties for defaults and delays in projects, which some private Indian companies, including some candidates for SP status, are well known for. A Pakistani English-language news daily, Dawn, has published comprehensive details of the China-Pakistan Economic Corridor (CPEC), a proposal that Beijing portrays as a vehicle for Pakistan’s development but which now appears as a thinly-disguised land grab that some in Pakistan already worry would compromise its sovereignty. CPEC has so far been considered a road, rail and infrastructure link that links China’s remote northwestern Xinjiang province with Pakistan’s Gwadar port on the Arabian Sea. The master plan, however, reveals a far more expansive project involving Chinese penetration into Pakistan’s agriculture, industry, telecommunications, surveillance and intelligence networks and even leisure and popular culture. “The plan envisages a deep and broad-based penetration of most sectors of Pakistan’s economy as well as its society by Chinese enterprises and culture”, says Dawn, stating that the plan’s scope has no precedent in Pakistan’s history. According to the plan, says Dawn, “thousands of acres of [Pakistani] agricultural land will be leased out to Chinese enterprises to set up ‘demonstration projects’ in areas ranging from seed varieties to irrigation technology. A full system of monitoring and surveillance will be built in cities from Peshawar to Karachi, with 24 hour video recordings on roads and busy marketplaces for law and order. A national fibreoptic backbone will be built for the country not only for internet traffic, but also terrestrial distribution of broadcast TV, which will cooperate with Chinese media in the “dissemination of Chinese culture”. Recognising the insecurity across Pakistan, particularly in the insurgency-ridden northwest, there is a plan to build a “pilot safe city” in Peshawar. In dealing with industrialisation, the master plan trifurcates Pakistan into three zones, earmarking specific industries for each zone. The western and northwestern zone, covering Balochistan and Khyber-Pakhtunkhwa, is marked for colonial-style resource extraction of chrome ore, gold, diamonds and marble. The central zone is marked for textiles, household appliances and future cement clusters. This is puzzling, since the plan notes that Pakistan is already surplus in cement capacity. Heavy industry is earmarked for the southern zone around Karachi and Gwadar ports. Gwadar, which New Delhi worries could be used as a base for Chinese naval vessels, “is positioned as the direct hinterland connecting Balochistan and Afghanistan.” The report notes that “some Chinese enterprises have started investment and construction in Gwadar” taking advantage of its “superior geographical position and cheap shipping costs to import crude oil from the Middle East, iron ore and coking coal resources from South Africa and New Zealand”. The CPEC is divided into a “core area” and “radiation zones”, which will feel the “knock on effects of the work being done in the core area”. Listed in the “core area” is “most of the Islamabad’s Capital territory, Punjab, and Sindh, and some areas of Gilgit-Baltistan, Khyber Pukhtunkhwa, and Balochistan”. This is effectively most of Pakistan. 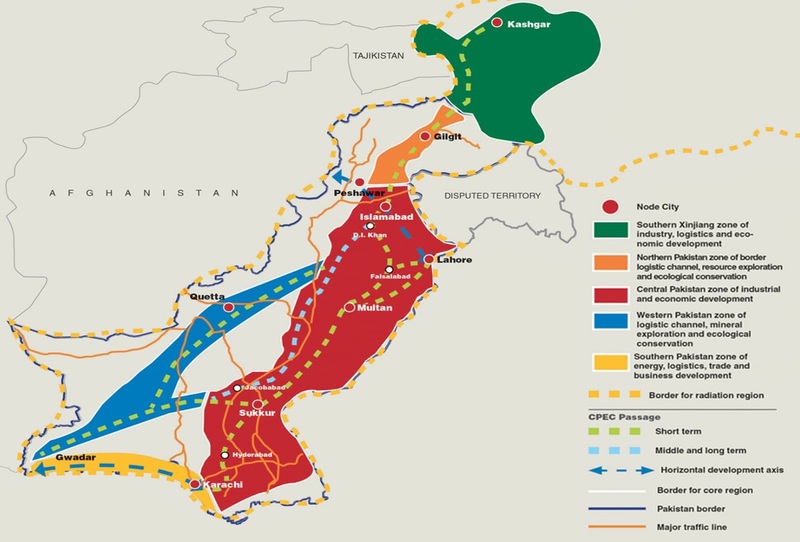 Dawn’s expose, entitled “CPEC master plan revealed” quotes from an original 231-page document, developed by Chinese experts and transmitted to Islamabad in June 2015. It is not possible to check the authenticity of the master plan. On Sunday and Monday, China hosted a major conference on its One Belt, One Road (OBOR) initiative, of which the CPEC is a key part. Prime Minister Nawaz Sharif attended the conference, along with representatives from about a hundred countries. India was a prominent absentee from the conference due to concerns that the CPEC, which passes through the Pakistan-occupied Gilgit-Baltistan region of Jammu & Kashmir (J&K), infringes upon India’s sovereignty, given our claim over J&K. On Thursday, before a closed-door gathering of private defence industry chiefs in New Delhi, the ministry of defence (MoD) unveiled its long-delayed policy for identifying “strategic partners” (SPs) – chosen companies that will partner global “original equipment manufacturers” (OEMs) in building defence platforms in India. While the MoD has not released details of the new policy, three individuals present at the meeting have shared with Business Standard the new policy’s scope, and the criteria and procedures for selecting SPs and foreign OEMs that they would partner. The policy’s initial aim is to shortlist six top companies as SPs in four technology segments – single engine fighter aircraft, helicopters, submarines and armoured fighting vehicles. A company can be nominated an SP in only one segment, and will have to indicate its preferences while applying. In 2015, the Dhirendra Singh Committee had recommended selecting SPs to build defence equipment. Last year the VK Aatre Task Force laid down criteria for selecting SPs in ten technology segments, including aero engines, artillery guns, ammunition and smart materials. For now, however, the SP policy has been confined to just four segments to cater for urgently needed battlefield equipment. This includes single-engine fighters, for which the air force has already initiated procurement. The navy has framed its requirements for its next six submarines under Project 75-I. 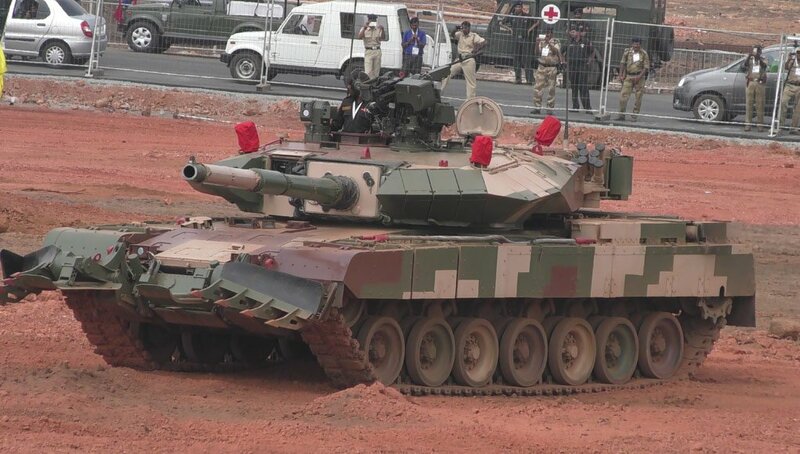 And the army, after exploring the indigenous option of developing its Future Main Battle Tank with the Defence R&D Organisation, has changed its mind and issued specifications for buying foreign tanks. For these procurements, which will all involve substantial in-country manufacture, the new policy envisages shortlisting Indian SPs and foreign OEMs through separate, but simultaneous, processes. The first six SPs will be chosen from amongst Indian private firms in a two-stage process. To make it past the “first gate”, aspirant companies would have to meet stipulated financial and technical criteria. They must be Indian companies, as defined in the Companies Act, 2013; and have no more than 49 per cent foreign holding, with no “pyramiding” of foreign holding. The MoD’s stipulated financial criteria weed out all except large, established firms. These include: consolidated turnover of at least Rs 4,000 crore rupees for each of the last three financial years; capital assets of Rs 2,000 crore; and a minimum credit rating of CRISIL/ICRA “A” (stable). The MoD will also consider companies’ records of wilful default, debt restructuring and non-performing assets. Companies making it past the “first gate” would undergo “site verification” in what is termed “Stage II evaluation”. A MoD team would visit company facilities to evaluate financial parameters and technical capability, with equal weightage given to both. In this second round of financial evaluation, it will be ensured that the applicant company’s solvency ratio (external debt to net worth ratio) is no higher than 1.5:1; and its modified solvency ratio (external debt plus financial guarantees to net worth ratio) is no higher than 2.5:1. The debt to EBIDTA (earnings before interest, depreciation, tax and amortisation) ratio can be no higher than 3. The “technical evaluation” will scrutinise the companies’ projects (launched, on-going, and also completed) over the last five years; the vendors it has developed; its research & development (R&D) budget and successes; certification and accreditation; and the number of certified quality auditors and quality assurance/control professionals as a percentage of its total employees. OEMs for each weapons platform will be selected primarily based on the “range and depth of transfer of technology” they offer India. The indigenous content they propose, the eco-system and supplier base they will develop, their plan for skilling Indian workers and future R&D in India will be evaluated in shortlisting OEMs. Preferably two or more OEMs will be shortlisted for each technology segment, but acquisitions will be taken forward even if just a single OEM makes the cut. Once a shortlist of SPs and OEMs is available in a particular technology segment, the MoD can proceed with procuring that platform by issuing a “request for proposals” (RFP) to SPs in that technology segment. The RFP will mention shortlisted OEMs, so that the SPs can engage with them, choose an OEM partner, and submit an offer in collaboration with that company. The MoD would then evaluate the offers, giving 80 per cent weightage to the price bid and 20 per cent to “segment specific capabilities”. The winning company, which has the best aggregate score, would have to sign a contract that includes a ten-year “performance based logistics” contract (which guarantees a certain equipment availability at all times), life-cycle support, including the establishment of testing and proving laboratories, and equipment upgrades further down the line. Sources say the policy, largely in its present form, will be cleared in a meeting of the MoD’s apex Defence Acquisition Council on May 15. The finalised SP policy will be included as Chapter VI of the Defence Procurement Policy of 2016, which was published last year with Chapter VI blank.